HA NOI (VNS) — Viet Nam pocketed two more bronze medals this morning at the 17th Asian Games (ASIAD) in Incheon, South Korea. 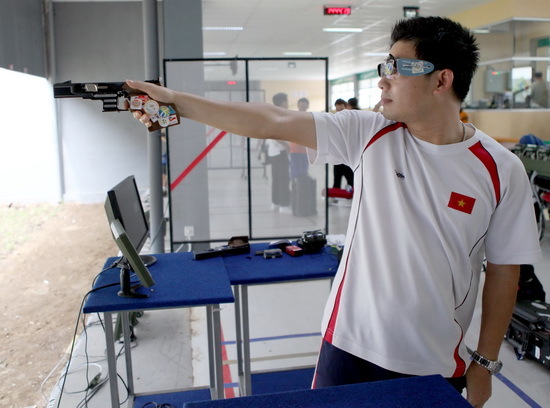 Marksman Ha Minh Thanh took the bronze in the men's 25m standard pistol event. The Vietnamese shot 571 points, lower than the score of Ding Feng of China at 577 and Kim Jun-hong of the hosts at 574. In rowing, Pham Thi Hai, Pham Thi Thao, Pham Thi Hue and Le Thi An took the bronze in the women's Quadruple Sculls Final A. China topped the event, followed by South Korea. In swimming, Hoang Quy Phuoc advanced to the finals of the men's 100m freestyle and will compete for a medal later this afternoon at the Munhak Park Tae-hwan Aquatics Centre. In badminton, the world's 23rd best player beat Thai Ponsana Boonsak, 21-10, 21-15, in the first round of the men's singles. He is the last Vietnamese representative in this sport as his teammate, Pham Cao Cuong, earlier lost in his second round match to Kidambi Srikanth Nammalwar of India, 21-23, 8-21.